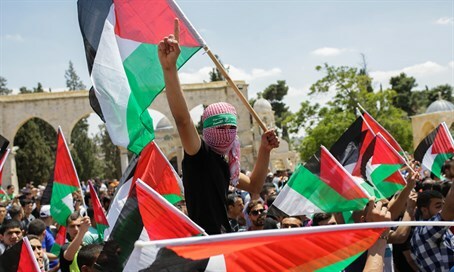 Friday's prayers saw the return of protestors affiliated with the outlawed Islamic Movement to the Temple Mount. In one frame, a large poster bearing the image of Nashat Milhem - the Israeli Arab terrorist who murdered three people in a Tel Aviv shooting spree earlier this year - can be seen. "The continuing incitement to terrorism on the Temple Mount proves there is no truth in what police are calling equality on the mount, especially with regard to searching the worshippers who visit," the organization blasted. "Many of the Islamic protesters also brought firecrackers and firebombs, and were still allowed access to the Temple Mount."